Yesterday morning, Atlus unveiled a new trailer for the latest game in the supernatural JRPG series Persona, revealing the games' main character. Within a matter of minutes after the reveal, fans celebrated a character they know barely anything about with some wonderful, wonderful art. But what it also hasn't stopped is amazing fan art! A lot of it imagined the reactions of former Persona protagonists - especially those of Persona 3 and Persona 4, the most popular games of the series in the west - meeting the new member of their 'club'. Mainly because, like the school chairs, that's really the only other part of Persona 5's imagery that we know of yet - as well as a theme about its characters feeling imprisoned by the society around them. So yes, lots of chains around this new guy seems to be fandom's current go-to. Oh yes, new protagonist. I see a lot of dancing in your future. 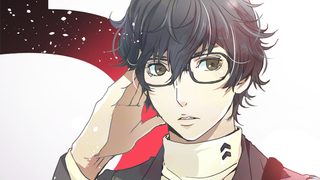 Persona 5 releases in Japan next year, on the Playstation 3 and Playstation 4.